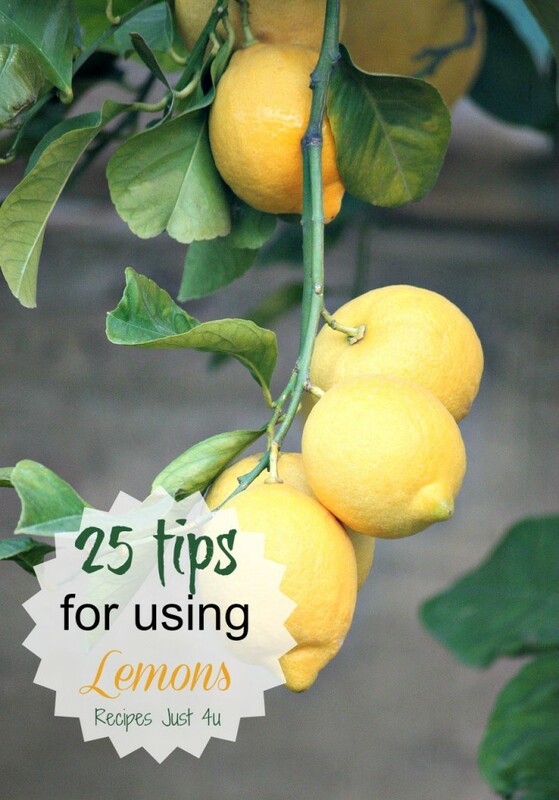 20 Creative Tips for Using Lemons. 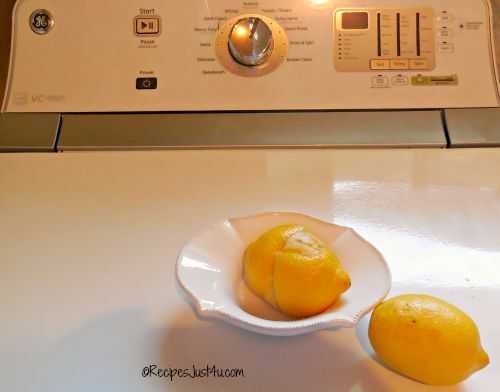 to clean a microwave – Just fill a container half full with water and squeeze a lemon into it. Drop in the halves of the lemon and cook on high for 3 minutes and then let it stand for another 5 minutes. Wipe clean. 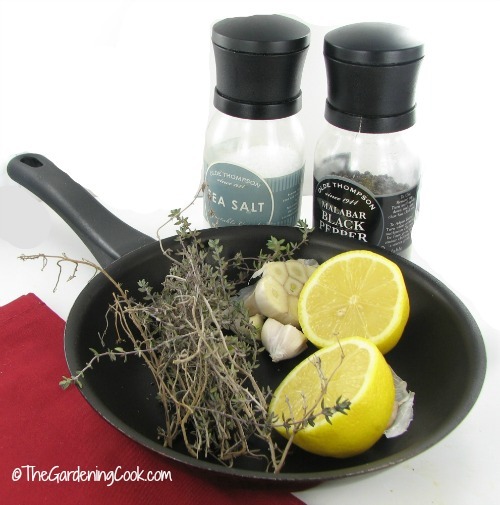 See my step by step tutorial with before and after photos on The Gardening Cook. butcher blocks. Do you have a butcher block counter top or wooden cutting board? Use a lemon to clean it. 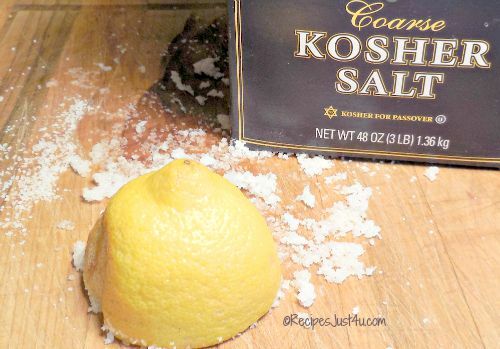 Just pour some coarse Kosher salt on the wood and cut a lemon in half and scrub the wood. Let is sit for about 5 minutes and then scrape off the salt and rinse with a clean sponge. It gives them a deep clean and gets rid of odors too! Polish copper. I love the look of copper utensils. But they easily can get tarnished. Lemons and salt, once again, will do a good job at cleaning them up. Squeeze lemon juice into a bowl and add salt to make a paste. Rub it over the copper, rinse and you will ge a nice, gleaming finish in seconds. 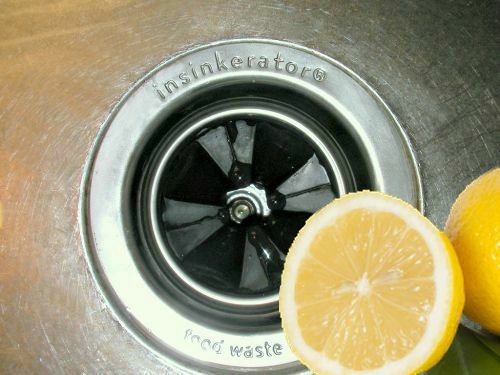 Deodorizing a garbage disposal. After you have used lemons in cooking, don’t throw the lemons away. Drop in some ice cubes, coarse salt and the lemon skins and turn on the disposal. 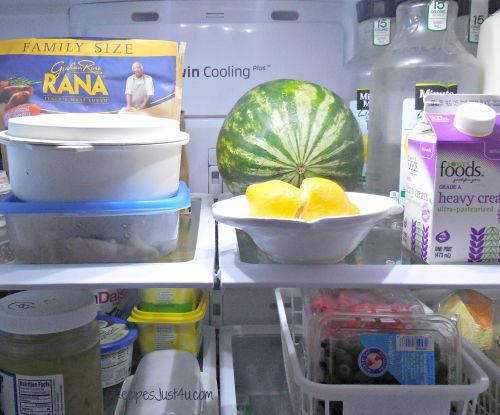 The ice knocks any remaining food off the blades and the salt and lemons do the job of deodorizing. Deodorizing the fridge. 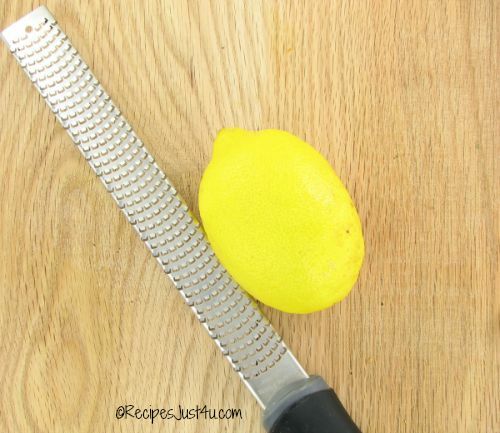 Ever needed just half a lemon for a recipe? Don’t throw the rest away. Place it in the fridge to absorb odors. hand deodorizer. After using fish or lemons, squeeze lemon juice on your hands and rinse with water to remove these odors. Counter top stains. 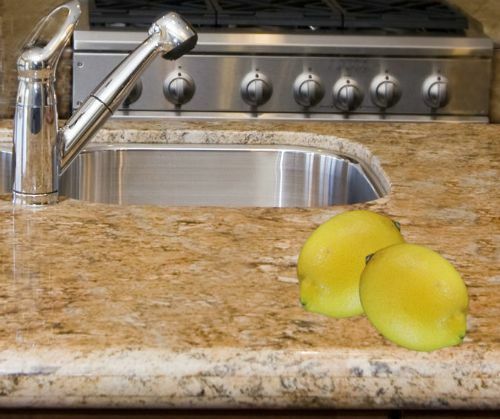 A granite or marble counter top may be beautiful and desirable but it is also porous and stains easily. Use 1/2 lemon and coarse salt to clean any stains that develop. 2. Beauty and Health Uses for Lemons. Your skin and hair will love the beauty benefits of lemons. Try using them this way. Instant moisturizer. 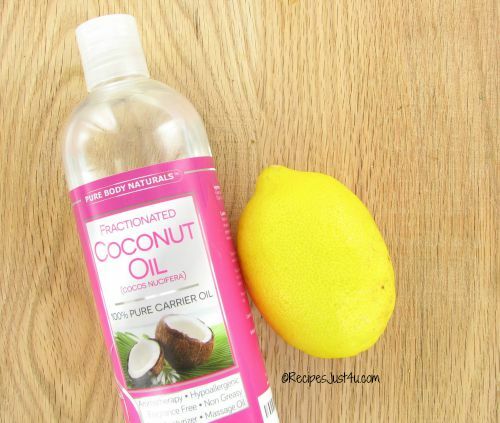 Mix a couple of drops of fractionated coconut oil with a few drops of lemon juice. The coconut will hydrate your skin, and the lemon juice will clear and brighten it. As a tooth whitener. 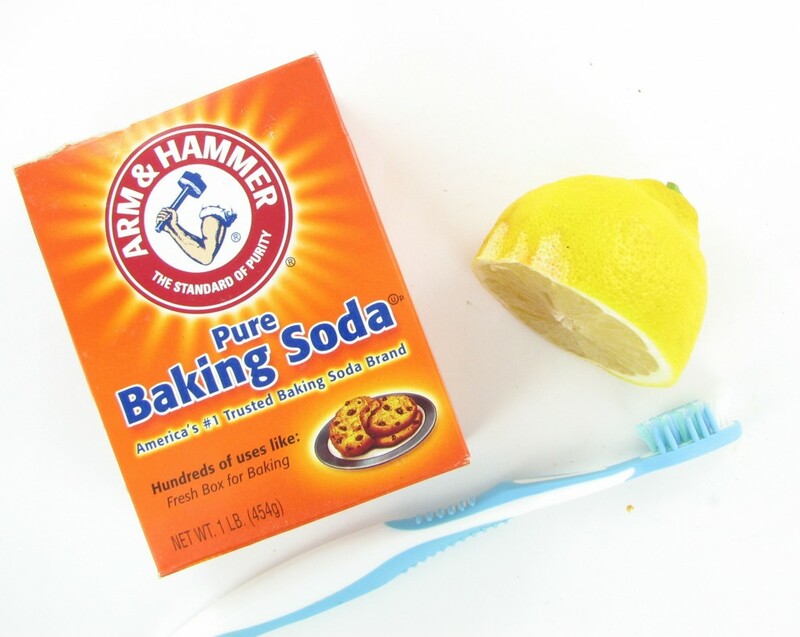 Mix together some baking soda and lemon juice and apply it to your teeth with a Q-tip. After applying the mixture, use a clean toothbrush to scrub your teeth, and rinse with cold water. Much cheaper than any tooth whitener on the market! Hair Lightener. I remember doing this as a teenager! Wet your hair and apply lemon juice before going out in the sun. The lemon juice acts like to accelerate to the sun’s natural hair lightening abilities. It magnifies the amount of lightening the sun can do, and this will create the subtle highlights. (It works like hair dye though, so it has to fade away and is semi permanent.) Here is an article from Instructables that shows the process. Disinfect cuts. To disinfect cuts and wounds, pour a few drops of lemon juice directly on the wound. (beware…it will sting, so not the best choice for the kiddies.) Also works to help cold sores heal more quickly. Faucet cleaning. 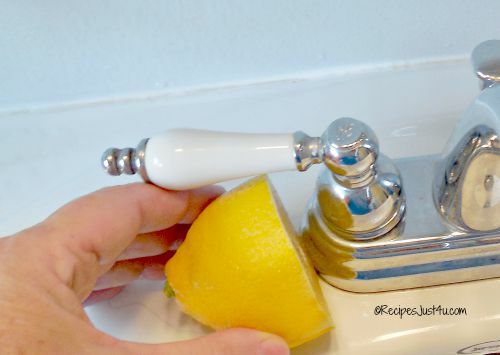 Use half a lemon on faucets, sinks and taps to reduce lime scale buildup. toilet cleaning. Mix 1/2 cup of borax powder with enough lemon to make a paste. This cleans the toilet as well as leaving it smelling clean and fresh. Bathroom Glass surfaces. 4 tbsp of lemon juice mixed with 2 liters of water to make a mixture to clean windows, mirrors and glass surfaces in your bathroom. Tub cleaner. Mix together an equal amount of water and lemon juice. This makes an effective cleaner to protect against mildew and fungus accumulating on the sides of your tub and/or shower. Lemon zest. The skin of a lemon has so much flavor in it. 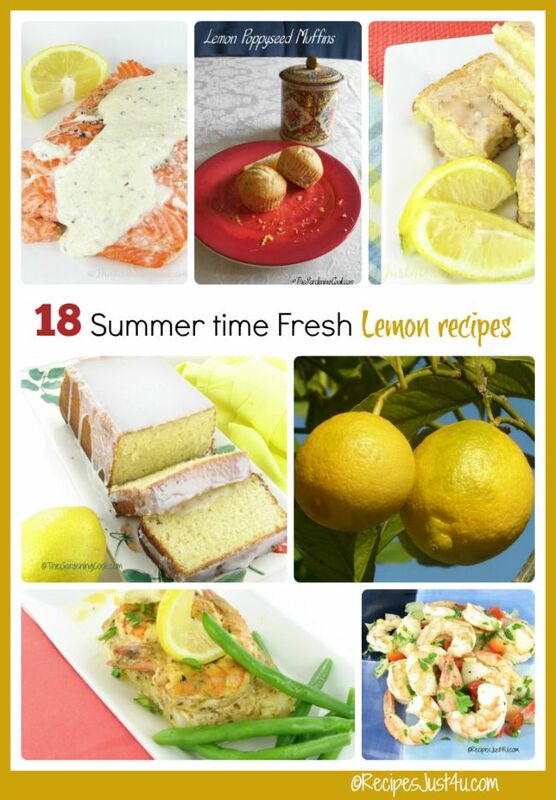 Use a good zester, and add lemon zest to your recipes for a burst of summer time freshness. Fluffy rice. Sometimes cooked rice sticks together. But it does not need to do so. Add a spoonful of lemon juice to the cooking water and then stir with a fork later for really fluffy rice. Keep guacamole green. 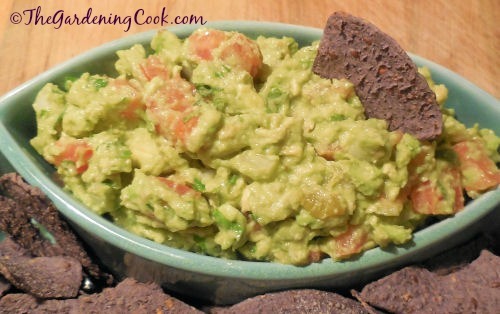 There is nothing quite like the taste of homemade guacamole. But having it turn brown is not appealing at all. Be sure to add lemon juice to your recipe to make sure the guacamole stays green on the table. This works with apples and pears too, to keep them from turning brown. Flavor a whole chicken. One of my favorite things to do is to stuff a whole chicken cavity with fresh herbs, garlic and lemon halves. It adds a fabulous flavor to a cooked bird. Keep color in your steamed veggies. Fresh vegetables can lose their bright color easily when they are cooked. Add some lemon juice to the boiling water to keep this from happening. 5. Around the house. 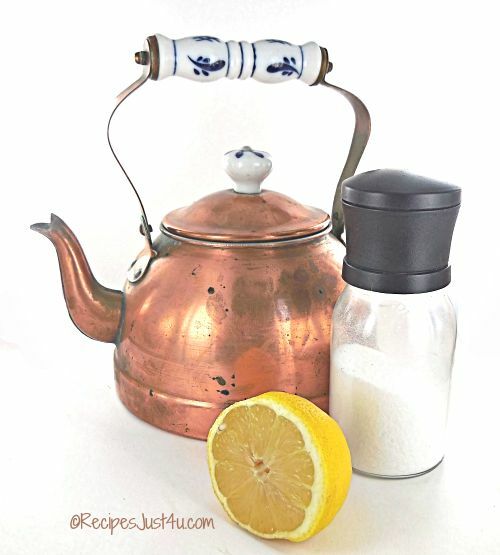 Lemons can be used in many other ways around the house. Here are a few ways that they can be used which may surprise you. Poison Ivy. Have you developed a rash from poison ivy and don’t have calamine lotion on hand? 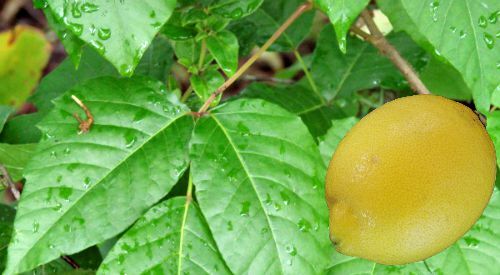 Try applying lemon juice directly on the skin to ease the itch and help to lessen the rash. Got warts? I remember when I was in college I had a horrible outbreak of warts. I tried everything to help remove them, and finally used lemon juice on the warts. The acid in the lemon helped to get rid of them! Underarm stains. Stains from perspiration can discolor clothing. Try adding equal parts of lemon juice and water to help remove the stains and leave the clothing smelling great too. In the laundry. Need to brighten up your whites? Add lemon juice to the wash to help brighten up white and light colored clothing. Kitty Litter box. A kitty litter box is notorious for its smells. 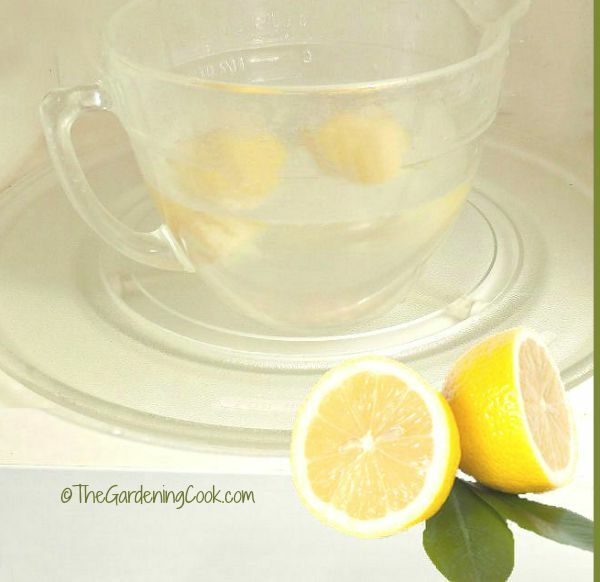 To neutralize this, cut a lemon in half and place it in the room near by to get rid of the awful smells. 2. New England Lobster with Lemon Chive Mayonnaise. 4. Lemon Blueberry Cheesecake Cookies. 6. Summer Macaroni Salad with Lemon Thyme Dressing. 8. Starbucks copycat Lemon Loaf. 9. Garlic Lemon Roasted Shrimp. 12. Oven Baked Cod and Shrimp with Lemon Mustard. 13. Steel Head Trout with Lemon Parmesan Sauce. 14. Sauteed Swiss Chard with Lemon and Parmesan. 15. Lemon Poppy seed Muffins. 16. Easy Garlic Lemon Chicken. 18. Shrimp Pasta with Lemon and Mushrooms.